Today's post mentioned "bark cloth" - and I had no idea what it was! A bit of Googling turned up this excellent thread from a eBay forum, and now I know. The picture at left if of the type of door covering that Helen most likely would've bought this is just a guess, although from the flotsam and jetsam left around here when we bought the place, I'd say it's a pretty good one. Here's the concise description from the eBay forum - go read the whole thing for more history! Barkcloth, in its original form was made from the bark of the Tapa tree in Hawaii. It is beaten, not woven. From that native cloth (if you come across that, it's now called "tapa" and is pretty rare), sprang forth what we NOW call barkcloth. Technically, barkcloth is a weave. To be exact it's a Momie Weave. From the 8th edition of "TEXTILES" (a textbook): "Momie is a class of weaves that present no wale or other distinct weave effect but give the cloth the appearance of being sprinkled with small spots or seeds. The appearance resembles crepe made from yarns of high twist. Fabrics are made on a loom with a dobby attachment or electronic control. "Bark cloth is a heavyweight momie weave fabric used primarily in furnishings. The interlacing pattern usually uses spun yarns and creates a fabric with a rough testure somewhat like that of tree bark, hence the fabric's name. 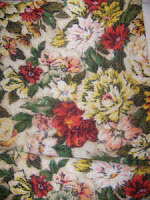 The fabric may be printed or solid. The rough texture adds visual interest to the fabric and minimizes the appearance of soiling." Before, during and following WWII, there were many GI's and sailors stationed in Hawaii. These sailors saw these brightly colored barkcloth curtains and other home furnishings (as well as some shirts) and brought or sent them home...back to the mainland. In the years following -- the late 1940's through the 1960's, bark cloth became a staple fabric in the home interior textiles market. The most collectible of these barkcloths are the atomic "Eames era" prints popular in the 1950's and early 1960's.